The easiest way to connect your audience through whatsapp from web view!! simple way to connect your whatsapp account to receive your own support complains and more! Brightery Web to Whatsapp WordPress plugin is amazing, All you need to do is to upload the file included and activate plugin, Start to adjust your own account and now you’re on!! Brightery Web to Whatsapp WordPress plugin made it easy to Customize your own colors to fit your website and make it suitable. Brightery Web to Whatsapp WordPress plugin Makes different accounts depending on person’s availability, And adjust it anytime with (profile picture – Name tag – job title). If your site is in multi-languages, you can set the text in each of those languages via WPML string translation module. 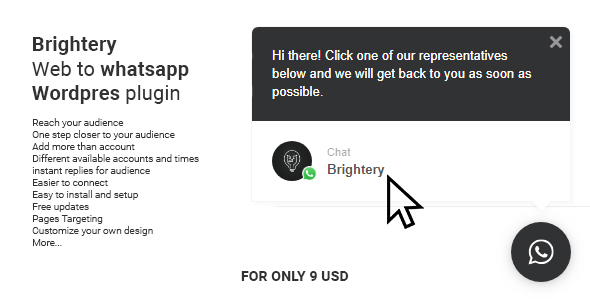 Brightery Web to Whatsapp WordPress plugin quick connect, Break the ice, make a default message to be send from the client’s side and make him more comfort when trying to connect you. Sometimes clients don’t know how to start a conversation.. Give a little help and win more clients. With Brightery Web to Whatsapp WordPress plugin You can show the WhatsApp box on the whole site or specific post types or even some particular pages. Brightery, New York is promising more amazing features in the next months coming up.